Absolutely love this light! I highly recommend it! Looks beautiful in my kitchen! 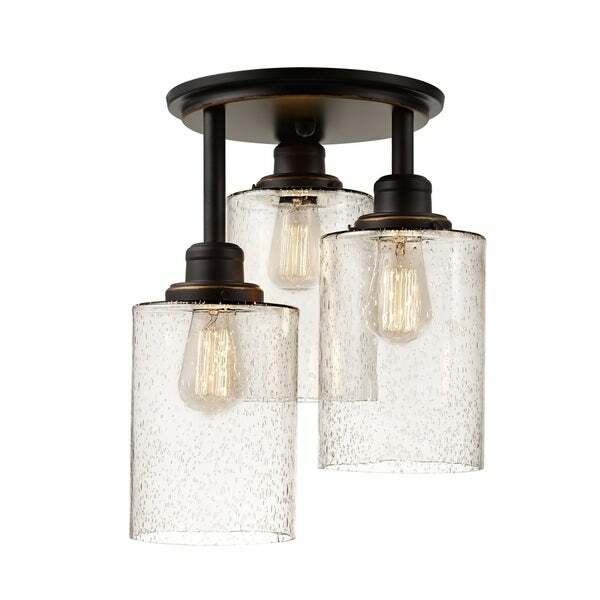 Globe Electric's Annecy Semi-Flush Mount Ceiling Light is a stunning light that would be great for an entranceway or main hallway so it can be seen when walking into your home. This flush mount pairs perfectly with the weathered look of the seeded glass shades to make this piece the epitome of rustic design. 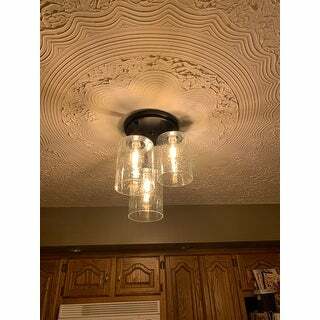 The clear glass means you can update the look of the fixture at any time simply by changing the bulb. Check out Globe Electric's assortment of designer vintage Edison bulbs to create a look that is truly your own. Includes all mounting hardware for quick and easy installation and requires three E26/medium base 60-watt bulbs (sold separately). Dimensions 13.0 In. X 13.0 In. X 15.4 In. This is a beautiful light, simple, elegant and I love the staggered design. Needed a flush/semi flush mount for the entry way and this fit the bill. The price was good and it looks great in the space. The clear glass lets the light shine through and the downward glass makes it so dust and bugs don't get trapped. I bought this light to replace a 1980s light/fan combo in the dining room. It's a lovely light for the price. The glass is really pretty and looks great with an Edison light bulb. It was easy to install and is a great addition to the remodel we're doing. I am very happy with this light fixture. I purchased 2 for our foyer. I was concerned it would look too small on a 10’ ceiling, but it looks good. The glass shades are larger then I thought. The quality is strong and they were easy to install. This is a beautiful fixture. The glass cylinders are much larger than I anticipated based on the picture. It is mounted in our hallway so i was worried it would be too large when i opened the box. However, it fits perfectly. I am very happy with this purchase. I am using this light in my bedroom and I love it. It has a rustic country look that competes the rest of my furniture. I would definitely recommend purchasing this product. 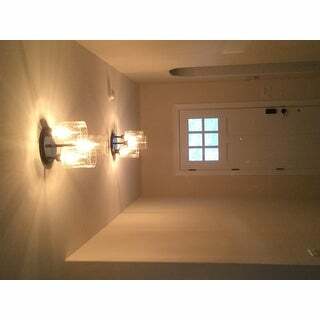 I needed a hallway light that was elegant and not too flashy and this was perfect. It gives great light while being displayed as a beautiful light fixture. 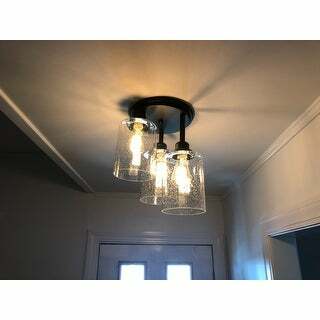 I recommend this light for small hallways or even a small bedroom. Absolutely gorgeous! Easy to install. A perfect fit for our hallway. Serious quality for such a low price. So glad that this was the one I chose! Received undamaged and my husband said that it was a breeze to install. Highly recommend! You will not be sorry! This light was easy to install. Very attractive in our newly remodeled kitchen. It gives off a lot of light. I would recommend this light to anyone. Package arrived undamaged. Loved the look of these lights. The only issue I had was the longest light was bent a little on both and they looked sort of weird, so my husband had to bend them out which was a little scary. But now they look great and give off a lot of light. Looks great! It provides a lot of light and it is exactly what we were looking for. Great and affordable. I would definitely recommend this light. Love the look and it gives off the perfect amount of lighting. Great buy! Love the size of these. Bought 2 for my foyer area. They are larger than youd expect. the reviews were right! Cant wait to see them in action. This light is much better than I expected! It’s simple design that fits perfect in my kitchen. Along with my island lights my whole kitchen lights up! Timeless! Updated a foyer perfectly!! "Will a standard E26 lightbulb fit in this fixture "
Yes a standard E26 will fit in this fixture. Looks like it will go with my others in our remodel.